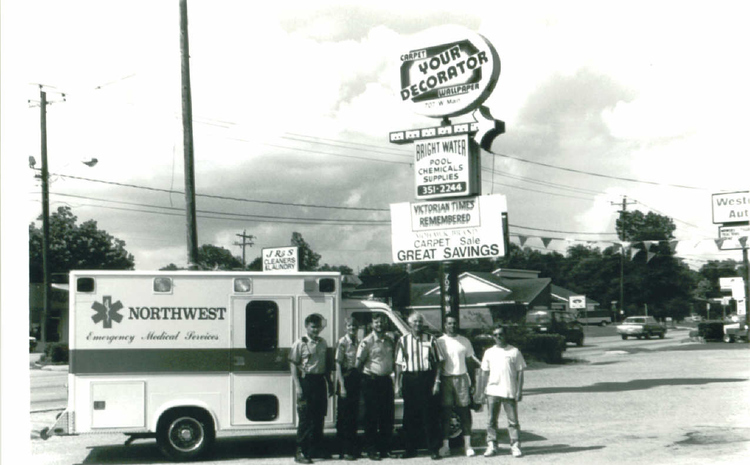 Northwest has served the community for over 35 years. In the early 1970's, ambulance calls in Tomball, TX, were answered by a nurse and non-medical driver from Tomball Community Hospital. Later, Tomball Community Ambulance would fulfil this role, but the struggling business would soon move its ambulances out of Tomball. With a critical need for ambulance service, citizens from Tomball, Rosehill, and Magnolia, with the support of Tomball Community Hospital, chartered Northwest Rural Emergency Medical Services Association in December, 1980. Tomball Community Hospital assisted with the purchase of supplies and an ambulance that was staffed by volunteers from surrounding communities. The first station, a repurposed slaughterhouse, was donated by the G. W. Brautigam family. The volunteers answered their first call in February 1981, and hired its first paid employee- a dispatcher and backup driver- in 1982. As the demand for service increased, the community stepped up to make sure ambulances were staffed and stocked and that no call for help went unanswered. Over the next 20 years, Northwest Rural EMS continued to grow in the face of increasing demand and funding challenges. In 2003, citizens in the Tomball area petitioned Harris County to form an Emergency Services District as a taxing authority responsible for providing emergency medical services. The newly formed Harris County Emergency Services District 8 entered into a contract with Northwest Rural EMS to provide EMS service to the District's residents. Throughout the years, Northwest has evolved from a rural volunteer ambulance provider to a sophisticated, full-service community oriented healthcare partner. Recognizing the expanding role of EMS systems in healthcare and public safety, the Board of Directors voted to change the name of the organization to Northwest Community Health in 2016. Today, Northwest Community Health continues to serve the rapidly expanding Tomball community. The organization has 6 licensed Mobile Intensive Care Unit ambulances deployed on a dynamic basis to meet system demand. In addition, Northwest also offers a variety of education and outreach programs, as well as a mobility assistance program that makes wheelchair and medical related transportation available to the Tomball area.